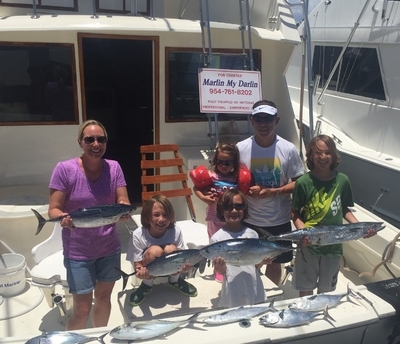 Both the fishing and weather patterns are now very much as expected for our July charters and Ft Lauderdale deep sea fishing on most days is providing some good action. When you live here you know that every day this time of year will hold the chance of a rain shower. I can recall numerous days when we had a brief shower or two even though the weatherman called for zero percent chance of one. But it has been pretty nice and all that comes with a south Florida summer day. Continued good bite on the reefs with the summer Bonito taking a lot of baits. Some Kings around when the Bonito give them a chance. We do far better on the kings as a rule when the Bonito back off a bit. Mahi-Mahi are available but scattered at best. Once again we are seeing the football sized Blackfin Tuna offshore of the reefline. A few Sailfish around and more than a few Sharks for those looking for a larger fish as opposed to just good general fishing action. Grouper , Snapper and Tilefish seasons remain open. Still some Jacks around. Slow on the Wahoo and hopefully the next moon will give us a few of those speedsters.